Is it legal to wait in the intersection at a green light? The Colorado Front Range doesn’t receive perpetual winters the way that other states do. Large snow storms often melt within 24 hours because of fluctuating winter temperatures which frequently exceed 50 degrees. Sure, CO drivers experience winter conditions when driving to the mountains but these are elective winter conditions (I can choose to drive into winter conditions for a six hour ski trip and then return to 50 degrees in Denver). Contrast this with the conditions in which I took my drivers test – a blizzard with single digit temperatures near Milwaukee – and it becomes pretty clear that people from states like WI grow up practicing winter driving. CO has become such a transient state that we now have a melting pot of all different kinds of bad drivers (California, Texas, New York, etc.). We commonly discuss that no one is actually from Colorado and meeting “natives” is like seeing a white rhino. With all of this in mind, I’ve noticed an interesting trend in Colorado: When turning left at a green light, many drivers don’t enter the intersection and instead wait behind the white stop line. The result at congested intersections is that once the light turns red, no one gets to turn. Rather, if cars wait past the stop line they can safely turn once the light turns yellow. Have you ever waited for several cycles of a light behind a (California license plate) driver who won’t edge their car into the center of the intersection? Growing up I would have found this ridiculous but in Colorado, it seems to be frequent (especially when I’m rushing home from work to catch tip off a badger basketball game). 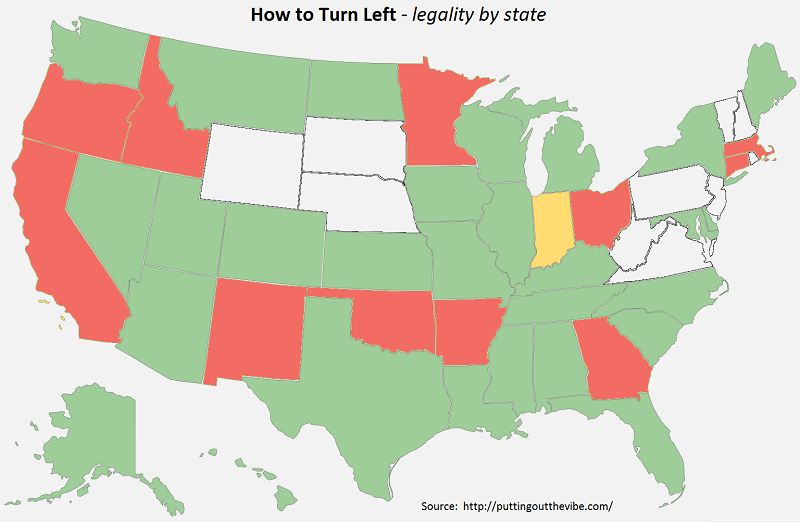 This is caused by each state defining their own traffic laws and as a result, many of Colorado’s transplant residents don’t know how to turn left. Interestingly, based on the CO Traffic Code MTC 604, it is legal in Colorado to wait in an intersection (as long as you’re not hindering traffic flow) and then proceed to turn once oncoming traffic has stopped. I set out to understand which states are ruining this interpretation of the law and my results are shown below. I’ll caution you that I performed this research on a state-by-state basis and many states blend safety recommendations into their traffic codes (laws). Therefore, it’s very possible that I have mistakes above so please let me know if anything needs updating. Some areas have city or county ordinances which contradict the state law relating to waiting in the center of an intersection. Austin, Texas has been promoting a well-publicized “Don’t Block the Box” campaign which, as far as I can tell, contradicts this article from the Texas State Troopers. Many states across the country are implementing flashing yellow turn arrows instead of solid green lights because research shows that drivers will use more caution when turning and may be less likely to mistakenly assume that they have the right-of way over oncoming traffic.